David Quessenberry was a left tackle and blindside protector. It probably helps that Quessenberry blocked for David Fales- an outstanding quarterback- but I like him as a prospect and think he’s certainly worthy of being drafted. Quessenberry can play with poor leverage at times and lacks an elite slide step. That said, he has impressive core strength. He anchors against the bullrush very well and is good for a few dominating run blocks a game through pure strength. I’d put his intensity level in the “nasty” category. He’s not as ramped up as Breno Giacomini or Luke Marquandt, but he does give very high effort and is a fighter in the run game. He’s also got the kind of size (6’5″, 302) and skillset to be an ideal tackle/guard swingman, though I think Seattle is pretty happy with its current guard situation. He also has 34⅜” long arms and was tied for having the largest hands in the combine group. I don’t know where Seattle would draft him, but Quessenberry has 2nd round measurables and his tape does nothing to spoil that, at least not in my opinion. If Seattle got him in the 5th round or later, I’d consider it a very good pickup, especially if Tom Cable feels good about Quessenberry’s chances to stick at tackle. Another player that Seattle brought in before the Harvin trade. Like Datone Jones, this visit is assuring because it shows that Seattle preferred faster 3-techs early in the draft. In recent years the most successful NFL 3-techs usually displayed excellent speed coming out of college. A tall receiver from a small school that is likely to go undrafted. Officially 6’3″ at 206 pounds. He ran a 4.50 forty at his pro day and posted a 37″ vertical. Seattle continues to pursue Ricardo Lockette types. It’s just a matter of time before they make a star out of one of them. A massive tight end, Williams was used mostly as a blocker for Alabama. Williams is 6’6″, 278, and ran a very slow 5.19 forty at his pro-day. Does Seattle view him as a long term project at tackle? I wonder. For two years in a row, the best value at quarterback goes by the name Wilson. I’d give Tyler Wilson a late 1st round grade based on his tape, but he could last into the 4th round after a snakebit senior season. Had he declared as a junior, it’s possible he might have gone #8 overall instead of Ryan Tannehill or even #12 to Seattle. I’m not a Ryan Nassib hater- but the nice things I would say about Nassib I’d also say about Wilson, and Wilson will most likely be drafted at least a round later than Nassib will. Wilson has drawn some comparisons to Jay Cutler, which seemed more appropriate than ever during the 2012 season when Wilson could no longer contain his frustration with the team. I see a lot of Matt Hasselbeck in Wilson’s game, and I’m not the first to make that comparison. Both are cerebral quarterbacks that score with a series of good decisions rather than explosive big plays. Both have better field mobility than their forty times would indicate and use that mobility to extend passing plays or take easy yards when the middle of the field is vacated. Both have a cocky/brash attitude. I think Wilson has a better arm and has fewer “wtf” moments. His sloppy release and his Andy Dalton / Jay Cutler lack of emotional control are my only significant knocks on him (I consider both of those to be pretty minor). While he’s not a classic read option quarterback, he’s got enough mobility that you may not have to scrap that wrinkle for him completely. I think he’d make an excellent backup with good potential to trade for a profit down the road. I think if he’s given a real opportunity he’ll be a starting quarterback somewhere in the NFL for at least a few seasons. At 5’11⅜”, 201 pounds with only a 4.71 forty time, Peters seems like an unlikely fit for almost any position in the NFL. A running back in 2011, Peters converted to corner in 2012 and had immediate success, albeit at a low level of competition. I think I like Peters more as a running back as he can make guys miss with moves which helps make up for his lack of speed, though it appears scouts are more interested in him at corner. To be fair, I don’t think Peters is as slow as his forty time indicates. On tape he looks roughly as fast as Jonathan Banks. Peters could appeal to Seattle as an undrafted free agent, as they aren’t scared off by corners that lack speed. When Pete talked about bringing in competition for his “USC backup crew”, it’s linebackers like Craig Wilkins who embody that idea perfectly. Wilkins is 6’1″, 239, and ran a 4.59 at his pro day. He’s a converted fullback. He’s very similar as a prospect to Seahawks’ backup Allen Bradford, who has similar measurables and is a converted running back. Wilkins would be one of our slower linebackers, but he’s one of the fastest linebackers in this draft and fights off blocks very well. Ashford is the NIU teammate of fellow Seahawk visit Martel Moore. That’s two NIU receivers on this list, for those counting at home. Been following Jordan Lynch much, Seahawks? If you want to learn more about Ashford, check out this article by the excellent Matt Waldman which highlights three of the draft’s most under-rated prospects (Ryan Swope is one of them. He also says Christine Michael is “a back whose athleticism and running style is the spitting image of Ahman Green.” You don’t say). Ahem. Waldman compares Perez Ashford’s game to Stedman Bailey’s. High praise for a player who will probably be undrafted. Ashford has solid NFL speed (4.50) and below average size (5’10”, 188), but has excellent jump ball skills, body control, and does very well after the catch. He fits the Seahawks’ criteria very well. Who goes to Harvard to be a fullback? That alone makes Kyle Juszczyk one of the draft’s more unique and memorable prospects. Just watch the video above. There is a lot of Gronk/Beast Mode in Juszczyk’s game. At 6’1″ it’s unlikely he’d stick at tight end in the NFL, so a conversion to fullback full time seems the likely course for him to take. Juszczyk’s appeal to the Seahawks is plainly stated, as Seattle has a 3rd running back spot open and appeared to be searching for RB/FB hybrids with unusual names last season (Vai Taua, Kregg Lumpkin). Michael Robinson is 30 years old this season, and Seattle has no depth currently for fullback. Another Ivy Leaguer. Catapano is a physical, high effort defensive end that reminds me of John Simon without Simon’s amazing arm combat. He seems like a good fit for a classic 5-tech role in a 3-4 defense because his core strength and discipline are both excellent. Seattle likes their Red Bryant types a little bigger than Catapano’s 271 pounds, but he has the strength and anchor of a bigger player and moves well. Another offensive tackle with some nastiness and some power. I like his taste in music. I’ve covered Daniels before. He’s one of my favorite quarterbacks in the draft regardless of draft stock, and I think Seattle would fit him very well. In my opinion he’s the second best pure read option quarterback in the draft after EJ Manuel. He’s worth a draft pick, though they might get him in free agency. He’s a corner that stands 6’2⅜” (though he’s just 181 pounds) and ran a 4.48 at his pro-day. Small school player. The second highest rated kicker at NFLDraftScout.com, Sharp made a 60 yard attempt at his pro-day with 21 NFL teams in attendance. A 5’9″ corner from Oregon State. Seattle’s interest in Watkins continues a 2013 trend that suggests they aren’t spooked by short defensive backs after all. John Schneider specifically mentioned Antoine Winfield’s physicality when asked why he signed the undersized corner. Is Watkins a similar story? I have no idea. The only “Brian Watkins” video on youtube is his sociology project on racism from last year. Thanks kip for the post , has a vicious streak seems to apply to Craig, what can I say. I love mean, nasty, aggressive, fearless, and fights for , these words slipped in from a scout’s write up. Critical Thinking 101. they mean a little more to me if a scout throws it into his critic. After all I’m just an amateur. A theme I have noticed with Seahawks draft picks as well as Schneider alluding to is toughness.Kyle Juszczyk jumps off the screen as a tough player. Hard to quantify toughness, but sometimes you can just see it. Last year with Courtney Upshaw as well. Toughness and versatility. Jusczczk is a great example of both. He can be a nasty lead blocking fullback and a TE with WR skills. Having multi talented guys like Juszczyk, Wilson and Harvin on the field at the same time would drive defenses nuts. Steve got hurt last year before the playoffs and he doesn,t really have the best range. I was almost ready to put Dustin Hopkins at 158. This is a more important position than some people give it credit. What would a kicker get for 6th round pick under the new CBA and what would be my saving over 4 years if he made the roster. Kip, please tell me if I’m wrong in remembering here but didn’t Tyler Wilson have the smallest hands measured of all the QB’s? He might have had the smallest hands at the combine, I think they measured a little girl in the stands who ended up having bigger hands than Wilson. Ok enough poking fun. Tyler Wilson’s hand size measured 8 and 3/4 inches at the combine. He is 6″2′. Those are some tiny hands. In a game where you have to be able to hold onto the football during a hard pump, and protect it while huge lineman hammer fist at the ball, having larger hands is a huge boon. One of the great things about our own Russell Wilson is that even at 5’10” ish, he had 10 and 1/4 inch hands. Even looking at a list of other QBs, several of which had ball security issues, like Dante Culpepper, Tyler Wilson measures comparably smaller. Michael Vick, who stands barely 6-0, has merely an 8½-inch hand. However, Drew Brees, who stands just 6-0½, has a hand of 10¼. A list of other quarterbacks and their hand sizes includes Brad Johnson (10 1/8), Patrick Ramsey (10-0), David Carr (9¾), Joey Harrington (9¾), Trent Dilfer (9 5/8), Jay Fiedler (9½), J.T. O’Sullivan (9½), Jake Plummer (9¼) and Chris Chandler (9¼). And while I don’t think that hand size completely makes a QB, I think it definitely helps, and is important for QB’s that don’t always stay in the pocket, or make improvised plays. Brett Favre always seemed like he was holding a nerf football when he was holding the ball, and I think he would have had issues playing the way he did if he wasn’t able to hold onto the ball as easily. So even with that, you still think Tyler Wilson is borderline 1st round material? Measurables definitely can change your draft position, and I think this might be one of those things I’d be worrying about. I hope that when they brought him in, they gave him footballs that had been dunked in water, and had him try to hold it, or pump fake hard, while trying to slap the ball away from him. His hands don’t seem to be a problem on tape. Sorta like Russell’s height. I would love Seattle to pick him up as the back up. He has the mentality to work along with Russell. His hands are just 1/4″ less than Matt Scott’s, and many other notable QBs. As Maz said, I’m not seeing the small hands show up as a problem on tape. John Schneider values big hands very highly, more than most GMs do. Russell Wilson has HUGE hands. He still brought in Tyler Wilson for a visit, so I think that shows that they only value hand-size so much. I’m right there with you Kip on converting Michael Williams to OT. I think he has the potential to be a monster. In addition to being a good pass catcher, he served as a 6th offensive lineman in the Obama offense. I would love for the Seahawks to pick up Juszczyk and Williams. Two tough guys who produce on the field. Williams measures slow but had a lot of big catches for Alabama, he knows how to find the gaps in the zone, and is a truly great blocker. Wilkins is a good example of why John & Pete will wait until the later rounds to pick up a Will LB, no one this year has the ideal fit of size, speed and production that Bobby Wagner had for R2 value last year. …I am now guessing Bennie Logan in R2 and John Simon in R3, one of the small school OTs in R4….can’t wait to see how John has graded these guys. I don’t think Quessenberry is falling past the 3rd round. I wouldn’t be surprised to see him taken in the 2nd with all the interest he’s been garnering since his Senior Bowl practice. As for Michael Williams, I commented in the last thread that I believe him to be a OT prospect. I think he is our fallback plan for David Quessenberry. I think he deserves to be a 2nd or 3rd round pick based on his talent, so that wouldn’t surprise me. Btw, I posted about Catapano the other day because he reminded me so much of Simon. I knew the boys here would like this prospect. What do you think? 5th rounder? Your dead on Kip–Ques is 2nd round material. I know some see him as an OG, but I could see him being a potential starter for the Hawks at OG and RT. Great feet, finishes every play, very long for 6-5, very versitile. Could replace McQ in ’13 as the swing and take the big russian’s job in ’14…that would save the organization a lotta dough. This is how I think the Seahawks draft board shakes out. Most guys have been linked somehow to the Hawks this off-season and in most cases fit a need on the roster. The round I believe they WANT to take the player is in parenthesis (not necessarily the round value they have assigned to the player). For example, looking at the quarterbacks, I think they have a 3rd round value assigned to Matt Scott, but would wait for the 4th round to actually select him (similar to the 3rd round RW coup last year after placing a 2nd round grade on him). QB; Matt Scott (4), Tyler Wilson (5), Zak Dysert (7). Scott and Dysert fit the system and Wilson, once developed, is a trade-flip using the Green Bay model. I think they will bring in BJ Daniels as an UDFA. RB; Christine Michael (3), Denard Robinson (4), Kerwyn Williams (6), Marcus Lattimore (7), Stepfan Taylor (7). Michael and Robinson are “special” and would be immediate offensive contributors. Lattimore is a luxury/PUP pick and Taylor is an all-around back they would look at if they didn’t get a game changer earlier in the draft. Williams may intrigue as a punt returner/3rd down back. They will want to bring in Latavius Murray as an UDFA. TE/FB; I think they could take one TE and one H-Back type. Travis Kelce, Gavin Escobar (3), Vance McDonald, Jordan Reed (4); Kyle Juszcyk (5); Nick Kasa (6); Willie Carter (7), Ryan Otten (7). UDFAs that fit are TJ Knowles, Josh Hill, and Jerome Cunningham. WR; Justin Hunter, Quinton Patton (2), Ryan Swope (3), Markus Wheaton (4), Aaron Donson, Marquise Goodwin (5), Chris Harper, Josh Boyce (6), Aaron Mellette, Tyrone Goard (7). UFDAs may include Uzoma Nwachukwu, Rodney Smith, Russell Shepherd, Greg Herd or Brice Butler. OT; Terron Armstead (2), Brennan Williams (4), Jordan Mills (5), Luke Marquardt, Garrett Gilkey (6), Michael Williams (Bama TE), Chris Faulk, Tanner Hawkinson (7). Finding a future replacement for Breno and an immediate replacement for McQuistan as the swing guy are probably the main ideas. LaAdrian Waddle and RJ Mills fit as UDFAs. I do think they have their eye on M. Williams, maybe to see what he looks like as a 3rd TE, but with the option of making him a practice squad project OT if he doesn’t have the speed to be a vertical threat. OG/C; No real need here other than finding a swing type. David Quessenberry, Kyle Long (3), Brian Winters, Dallas Thomas (5). 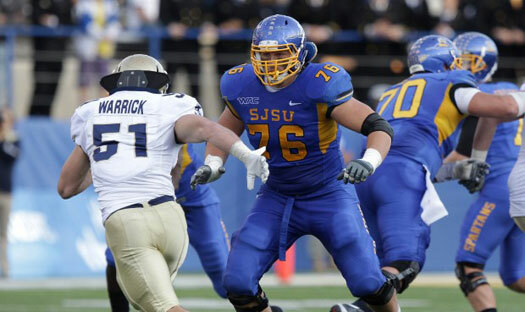 They are interested in Ryan Jensen as an UDFA. 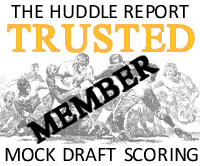 Josh Dworaczyk and local product Drew Schaefer are versatile and tough and could be UDFA swings. DT; Sylvester Williams (2), Kawann Short (move up into mid-3), Brandon Williams, Johnathan Hankins (4), Bennie Logan, Kwame Geathers, Stephan Charles (5), Montori Hughes, Quinton Dial, Nich Williams, Jordan Hill (6); UDFAs include Michael Brooks, Isaac Remington, and Brandon Moore. This is a great year for DL UDFAs and I expect the Hawks will bring in 3 or 4. DE; Alex Okafor (3), William Gholston (4), Cornelius Washington, Michael Buchanan (5), David Bass, Devin Taylor (6), Wes Horton, Rufus Johnson, Glenn Foster, Quanterus Smith, Armonty Bryant (7). UDFAs include Brad Madison (possible 3-tech rusher), Earl Okine, Travis Long, and Walter Stewart (Leo/PUP candidate). Great depth in this class of DEs—I think some of these guys will also be looked at as 3-techniques. Smith, Long, and Stewart are Leo candidates, but may not be available right away. LB; Arthur Brown (move up mid-2), Jamie Collins, Khaseem Greene (2), Sio Moore (3), John Bostic (4), Zaviar Gooden, Trevardo Williams (5), Jayson DiManche (6), Jelani Jenkins, Vince Williams, Sam Barrington, Craig Wilkins (7). Hawks may look for a WLB early and some special teams/MLB backup types late. UDFAs of intrigue include Will Compton, Luke Batton, Steve Beauharnais, and Tom Wort—mostly to replace Heath Farwell at 1/3 of the price (though lets face it—he’s worth every penny). CB; The Hawks will likely choose one, but I think it is going to be late and the kid will need to be long and fast or able to return punts to beat out one of the six that they own. David Amerson, Darius Slay (4), Will Davis, Jordan Poyer (5), Jeremy Harris (6), Sanders Commings (7). Amerson has all of the measurables and great ball skills. He is a chance taker that a guy like Earl Thomas would cover up by cleaning up his mess every now and then. I think they love the size/speed combo of Harris and may reach for him a little. UDFAs Dontra Peters, Rashaan Melvin, and Marcus Cooper fit the prototype. S; TJ McDonald (5), Duke Williams, Josh Evans (6), Earl Wolff, Cooper Taylor (7). UDFAs John Boyett, Jawanza Starling or Alonzo Tweedy may get looks as Maragos replacements on special teams. The Hawks seem smitten with Williams and Evans has the Quinn connection. ST; Quinn Sharp, Dustin Hopkins P/K (7). UDFA Kevin McDermott (LS). I feel the Hawks are almost certain to spend one of the 7ths on a kicker to battle with Hauschka and Wigg. Sharp adds the bonus of being an above-average punter as well. Good list, thanks for putting that together. Do we know if Q Patton returned punts in college? He did return some kicks. Yes, good list, thanks for sharing. Thanks for the write up of all the players that visited. Very helpful to get a look at the possibilities. I think that’s the wrong “Ryan Jensen.” The guy in that highlight video plays for Old Dominion. Ryan Jensen of this year’s draft and who visited the Hawks spent 4 years at Colorado State-Pueblo. Hell of a highlight tape, I was really let down when I found out it was the wrong guy.